Tuesday Tasting is a regular feature of Lyke2Drink that explores some of the best beers, wines and spirits on the market. This week we sample a cask strength Irish whiskey. Midleton Distillery in Cork is part of the Irish Distillers Group, which makes a number of famous Irish whiskeys, including Jameson, Powers and Midleton. They make Redbreast, a brand that was re-introduced in the 1990s. The traditional Redbreast 12 is a single pot still whiskey that has racked up a truckload of awards in recent years, including the Whiskey Adovcate Award as Irish Whiskey of the Year in 2012 and the Malt Advocate Irish Whsikey of the Year title for 2011. 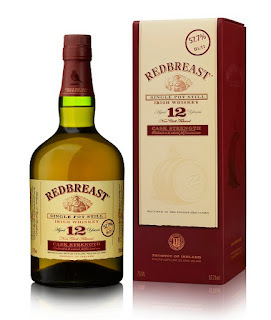 Redbreast 12 Year Old Cask Strength has more flavor and vibrancy than you will experience with most Irish whiskeys. It is a rich amber gold color and the nose is sweet, with hints of apple and figs. The flavor is full with spices, apple and tropical fruit, finished with nice amounts of oak. The 115.4 proof is present, but not overpowering. If you have found most Scotch to be too assertive and most Irish whiskey to be too light, Redbreast might just hit your sweet spot. Redbreast 12 Year Old Cask Strength has a suggested retail price of $65 per 750 milliliter bottle. Janet Sheed Roberts, at 110 years old, is the oldest person in Scotland. She is also the granddaughter of William Grant, who founded the Glenfiddich Distillery 125 years ago. To celebrate Roberts' longevity the distillery created a special 11 bottle set of a 1955 single malt Scotch, marking each decade of her life. The company is auctioning off the whisky at special fundraisers and breaking records along the way. They have become the most expensive bottles ever sold at auction, according to Glenfiddich. 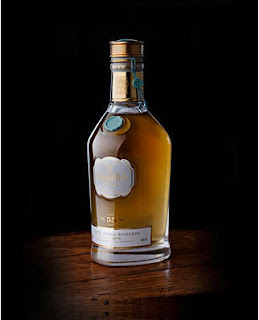 The first sold at Bonhams in Edinburgh in December for a record-breaking $72,630, topping the previous world record of just under $47,500 for a bottle of single malt. The second was bought by an anonymous bidder at the Honourable Artillery Company in London at an event hosted by HRH Prince Harry for $69,500. On Friday, a bottle of Glenfiddich Janet Sheed Roberts Reserve Single Malt Scotch Whisky sold for $94,000 on New York's Liberty Island at a fundraiser for SHFT Initiatives, which promotes sustainability issues through the intersection of commerce, art and design, and communication. The event was hosted by Adrian Grenier, who played Vincent Chase in the HBO series Entourage. Tuesday Tasting is a regular feature of Lyke2Drink that explores some of the best beers, wines and spirits on the market. This week we sample a Belgian-style beer from a South Carolina brewery. Westbrook Brewing is a relatively new craft brewery in Mount Pleasant, SC., just across the bridge from the historic city of Charleston. The brewery has quickly gained the attention of craft beer drinkers in the southeast. 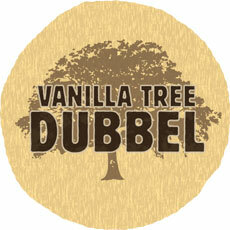 Westbrook Vanilla Tree Dubbel is a Belgian-style dark ale brewed with a crystal malts and dark Belgian candi syrup. Whole vanilla beans and toasted oak chips are added to the beer during aging. The beer pours a reddish brown with a firm tan head. The beer has a malty nose and the flavor has plenty of body, with hints of dark fruit, malt and solid vanilla notes. Not as heavy as some Belgian-style ales.